These artist quality Sennelier Oil Pastels were originally developed by Sennelier in collaboration with Pablo Picasso. Today they have been refined and introduced in a new "Grand" size. 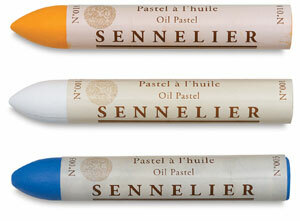 Creamy smooth Sennelier oil pastels are rich in pigment, cover beautifully, and have outstanding opacity. They may be thinned with turpentine and worked with a brush. Sennelier pastels are acid-free and can be applied to any surface. At ¾" diameter × 5" long, each of these pastel sticks is equivalent to eight regular size sticks.